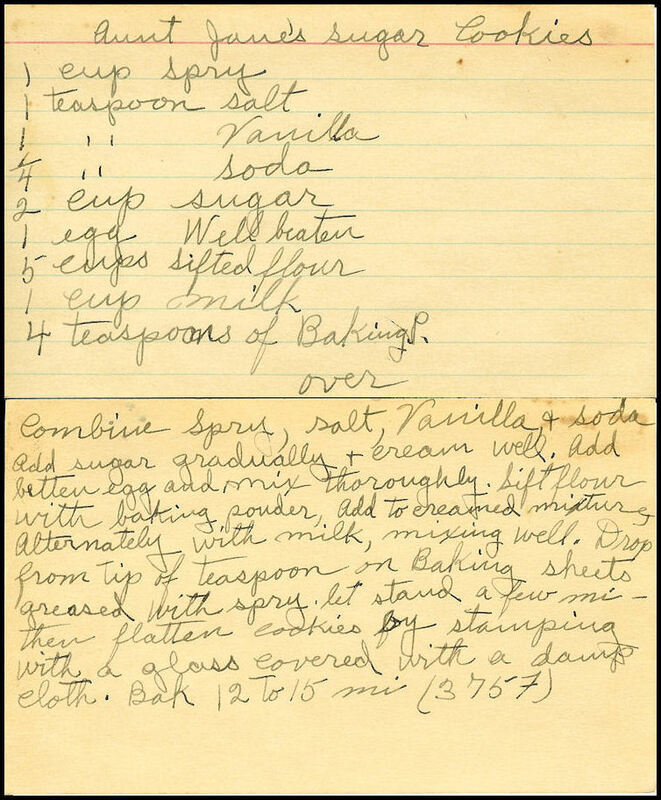 This recipe was handwritten by my great aunt, Hazel (HILL) BECK, and was one of many in this recipe box her daughter gave to me. Now, I'm not sure if "Aunt Jane" was a friend's Aunt Jane, or a company called Aunt Jane, or if it was Hazel's great aunt, Jane Lois (HILL)(STORY) ROBB, who died in 1917. The mascot for Spry Shortening was a character called "Aunt Jenny" (portrayed by Edith Spencer.) It could be that my Aunt Hazel wrote Aunt Jane instead of Aunt Jenny. Who knows? What I DO know is MY great aunt wrote this recipe, probably made it, and it's at least 60 years old. I transcribed it as written. Comments I added are in brackets. 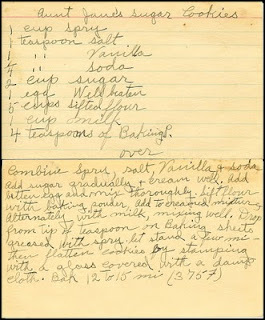 I was thrilled to find your recipe doing a search for 'Aunt Jane's Sugar Cookies'. I have an exact duplicate, except for the handwriting, of your card recipe that I copied from my grandmother in Iowa, probably in the '60s. The name is the same, the ingredients (Spry), the order, and all the instructions are exactly the same. I remember helping her make the cookies as a little girl by flattening them and sprinkling them with sugar before putting them in the oven. I've made it for years and it is one of my favorites that I was just asked to provide to my daughter-in-law so she can include it in a recipe collection for her daughter (my grand-daughter who has also helped me make them) we all love the cookies! My conclusion is that the recipe must have been broadly available through some source many years ago and is not only from a source in your family. Time marches wonderfully on and on...and isn't technology amazing that we can share these things! What a precious find! I believe our mother also wrote her recipes on index cards this way and kept them in a small box with a hinged lid. Do you think Uncle Lee has them? My Mom also called them Grandpa's depression cookies because they were cheap to make. I still have the cookie jar she used. I also got to press them with a damp piece of sheet tied around a drinking glass. Oh I miss my parents so much. Such cheap fun. My Mom called these Grandpa's depression cookies later on. They were cheap to make. I also remember using a damp piece of sheeting tied with string to a bottom of a drinking glass. What fun and cheap bonding.